This is a curious composition because it places two major rivals of the kabuki theater together in one setting, but from two different plays. 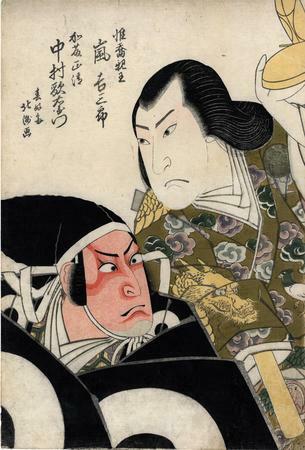 Kichisaburō from Toki wa Ima Ariwara Keizu (時再興在原系図) and Utaemon in Hachijin Shugo no Honjō ('Eight Battle Arrays to Protect Honjō Castle' - 八陣守護城). "Both actors were very popular rivals, but they did not act together for some twenty years. Utaemon III and Kichisaburo II are shown here together because they announced to have planned to act together in a play in the autmn 1821. The announced joint performance never took place, because of Kitsubaburō's sudden death in 9/1821." This is quoted from Ōsaka Kagami 大阪鏡 by Jan van Doesburg, p. 22. The example shown in the van Doesburg volume has a publisher's seal for Oki. The examples in the Museum of Fine Arts in Boston and illustrated in Schwaab and in The Theatrical World of Osaka Prints by Roger Keyes show no publisher's seal. On page 66 of Keyes' The Theatrical World of Osaka Prints it says: "This double half-length portrait was perhaps the first oban print of its type to be published in Osaka. There are at least three states of the print, although the order of their issue is uncertain. One has a yellow ground; one has an uncolored ground and some signs of wear; another with uncolored ground bears the mark of the publisher Tamaoki." There are three prints in the Lyon Collection showing Utaemon III as Katō Masakiyo. Each shows him in the same dramatic costume and is said to date from ca. 1820. The other two are by Hokushū and Yoshikuni. 1) black and white in Ukiyo-e Masterpieces in European Collections: Musées Royaux d'Art et d'Histoire, Brussels, vol. 9, Kodansha, 1989, p. 205, #132. 2) Catalogue of Japanese Art in the Náprstek Museum published by The International Research Center for Japanese Studies: Nichibunken Japanese Studies Series 4, 1994, p. 140. 3) color in Ukiyoe Museums in Japan (Nihon no ukiyoe bijutsukan - 日本の浮世絵美術館), vol. 5, p. 147. This example is from the collection of the Ikeda Bunko Library. They give the play title as Hade Kurabe Isemonogatari, Hachijin Shugo No Honjo. 4) color in Schätze der Kamigata: Japanische Farbholzschnitte aus Osaka 1780-1880, MNHA (Musée national d'histoire et d'art Luxembourg), p. 50, #37. 5) color in Ikeda Bunko, Kamigata yakusha-e shūsei (Collected Kamigata Actor Prints) Volume 1, Ikeda Bunko Library, Osaka 1997, no. 87.